Second Life Unofficial Obama HQ Info and Landmarks, originally uploaded by Spinning Away. The current US Presidential primaries are fascinating to the political nerd. This is because of the very open nature of the contest on both the Republican and Democrat sides not to mention the byzantine selection contest. The prospect of the first female or black President makes the selection fascinating for what it can tell us about the current state of US politics. But whilst the selection of a black or female candidate would be a great social change, it is unlikely to make much difference politically. In policy terms there is not much radical about the agenda of either Clinton or Obama. As Gary Younge points out about Obama in the Guardian "He has the role of an inadequate and ineffective balm on the long-running sore that is race in America. His victory would symbolise a great deal and change very little." Of course, here on Perspective we like to keep track of how things are shaping up for the politicos on the virtual worlds. Second Life is popular of course. 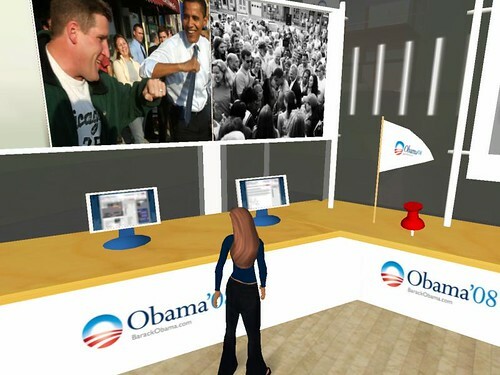 There is a John Edwards area in Second Life and both Clinton and Obama have been out and about drumming up support. Obama has made good use of social networking tools which is interesting, with SL being just one of those. But the prize has to go to Republican Ron Paul whose supporters hosted a march in World of Warcraft. As wowinsider reported "On New Year's day supporters of Republican presidential hopeful Ron Paul gathered on the Whisperwind (US) realm in World of Warcraft to march across Azeroth and show their support for their candidate of choice. The rally started outside Ironforge with approximately 240 players (with 400 members in their RP Revolution guild) and traveled to Stormwind, Westfall, Booty Bay, Ratchet, and finally Orgrimmar."